The best, healthy, quick and easy pineapple rice recipe made in one pot with simple ingredients over stovetop. Also known as Hawaiian rice, it’s inspired by Thai flavors. 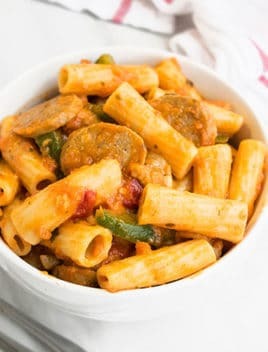 It’s a sweet and spicy 30 minute meal with a spicy kick from jalapenos. I really like to make rice for dinner because you just dump everything in a pot and dinner’s ready in 30 minutes. I also find it to be economical, filling and the flavor possibilities are endless. Here are some of my family’s other favorite rice meals: Bacon Fried Rice (One Pot) and Sausage and Rice (One Pot) and obviously Chicken and Rice (One Pot). Today’s recipe should not be confused with Thai pineapple fried rice recipe, in which leftover cooked rice is used. 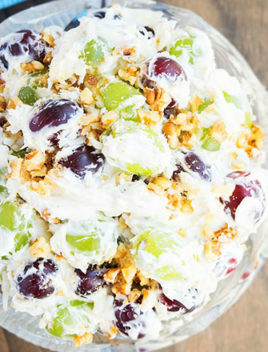 You can serve this as a main course or a side dish. 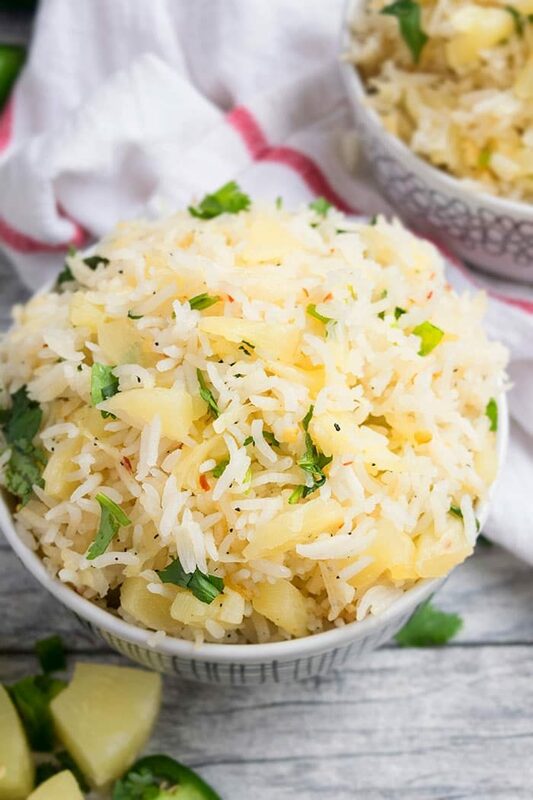 How to make pineapple rice pilaf? Add pineapples, salt, pepper, red chili, lemon juice, rice, water, pineapple juice and mix. Garnish with cilantro and you are done. 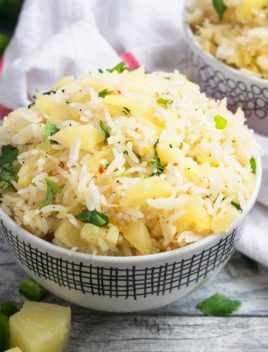 What to serve with pineapple rice recipe? 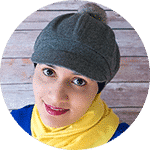 Make pineapple chicken rice- Saute 1 cup chicken (cut into small cubes) with the garlic and jalapenos first until golden brown and rest of the steps are the same. Add shrimp- Saute 1 cup shrimp with the garlic and jalapenos first until golden brown and keep aside. Mix them in at the end when the rice is ready. 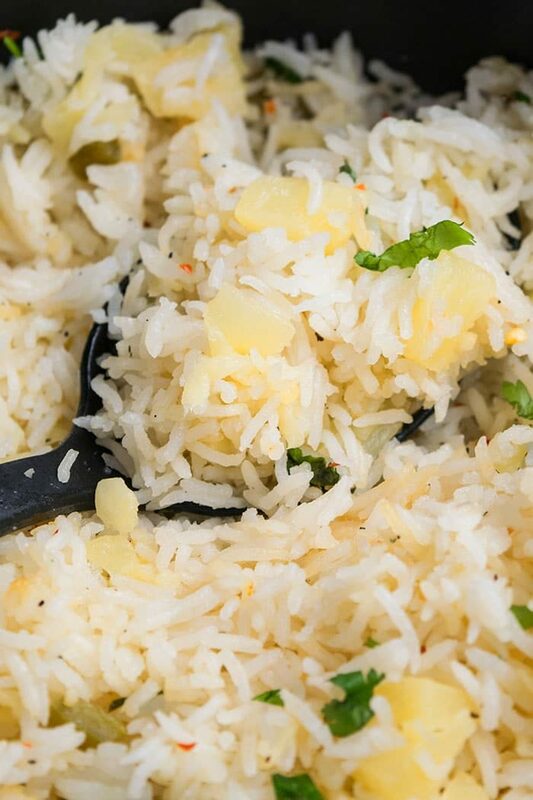 Make coconut pineapple rice- Add 1/4 cup toasted shredded coconut (sweetened or unsweetened) in this recipe. Turn this into a rice bowl: This involves serving a bowl of this Hawaiian pineapple rice with some pan-fried vegetables and sweet and spicy chicken, beef or shrimps. Add vegetables- Add 3/4 cups frozen vegetables of your choice. Add nuts- Sprinkle some roughly chopped, roasted cashews or peanuts on top, prior to serving for a nice crunch. What rice to use? Either Basmati rice or jasmine rice can be used. Don’t use any other rice because it does not taste good and brown rice takes so long to cook. 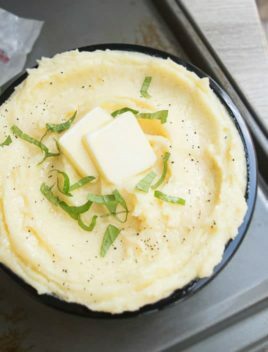 Use unsalted butter- Because this prevents the meal from becoming too salty. 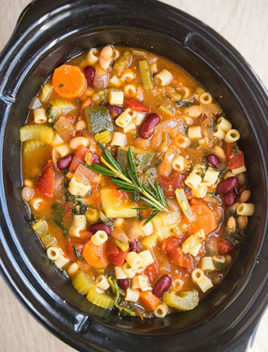 Use nonstick pot- Because this prevents sticking and burning. Fresh pineapples or canned pineapples? Either can be used. I prefer canned pineapples since it’s convenient. Also, CRUSHED pineapples work much better in this recipe than compared to sliced or diced pineapples. Adjust the spice level– This can be done, based on your preference. Add more or less jalapenos and red chili flakes. Always check the flavors near the end and adjust accordingly. Remember to de-seed jalapenos, especially if you don’t like spicy food. 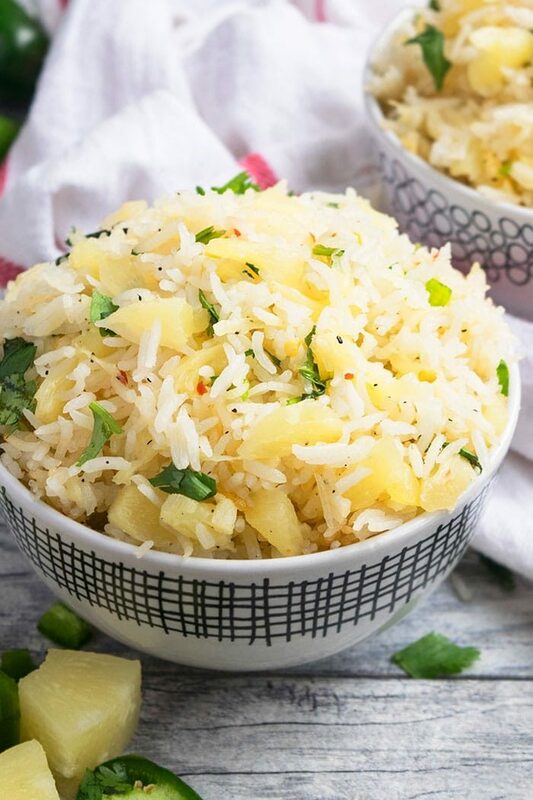 Quick and easy pineapple rice recipe made in one pot with simple ingredients over stovetop. This Thai/ Hawaiian sweet and spicy 30 minute meal has a spicy kick from jalapenos. In a large nonstick pot, heat butter and oil over medium high heat. Add garlic and jalapenos and saute for about 1 minute. Add pineapples, salt, pepper, red chili flakes, lemon juice, rice, water, pineapple juice and mix until fully combined. Cover the pot and reduce to medium heat. Cook for about 15 minutes or until rice is fully cooked and water is absorbed. Turn off the heat and remove the lid. Allow the rice to cool down for about 10 minutes. Fluff it up with a fork. Garnish with cilantro. Add some more lemon juice on top and enjoy!